The World (R) indicates that your movement and growth have been slowed down to the point of being stopped because of your refusal to explore new horizons. You are experiencing information “overload” which is creating confusion and indecision. Be willing now to try new ideas or your own fear will create the inability to increase your spiritual growth. You have experienced many lessons in your lifetime – trust that you have learned from them and stop resisting change – it is always beneficial! When you need encouragement – cry out for help! Try something different, be willing to accept other people’s ideas as well as your own. They are here to assist you in whatever you wish to accomplish – they are here to bring you to your heart’s desire. Be confident in the process. To make full use of your power, you must first have a clear image of what you want so that you can quickly eliminate anything that doesn’t conform to that picture. Remove the emotional blocks. Your “inner” voice will fight you when you begin to put road blocks in the way of the good that you could have. You can not ask for anything more than the best that Life has to offer and you must be willing to turn to it with confident expectancy. You may be at a standstill for the moment – but the freedom and the rapture of the World always exists in potential and will be released when you feel ready to begin the dance of life again. Practice being yourself, develop the creativity that comes from your center and allow yourself to enjoy it. Be willing now to express yourself completely and trust in the Power that gave it to you. Don’t worry about what other people say – what they think about your creations is not relevant. The independence of your spirit is essential in your growth, you take the sting out of your inner problems by airing them and recognizing them for what they are. See clearly now that the World represents a goal – it represents hope and intuition – the way to that goal lies in the images of your “inner” Self. Accept the mystery and magic of the Universe, have faith in the “inexplicable” – see beyond the physical eye. Having missed the mark and either aware or unaware of that fact. What are you doing to free yourself from the limitations and restrictions in your life? What are you doing to work freely within them? What potential do you see in yourself and in the world? What physical needs must you take care of? What is making you dance for joy? In the first position: It may fall to you to focus that large over-viewing intellect of yours on very specific issues that need intense work. The specific cannot be valid unless it knows where it fits in the bigger picture. In the second position: The world that you have depended on may not be as you left it; it may be changed, perhaps smaller. At another extreme, the suggestion is that you need to pare down the size, the contents of what has been your world. In the third position: The world can be no better or no worse than we make it. In the fourth position: At one extreme, this is a dream for a fantasy world or a piece of the real world to be frozen in time. At the other extreme, there is a distortion in the vein of “save the world” or of wanting to conquer the world – to possess it. In the fifth position: At one extreme, is the recognition that your world is a little smaller. At the other extreme, your world is much bigger than you realize. There may be hubris here. Ironically, sometimes the achievement is noteworthy only to be spoiled by a sense of pride or arrogance that is bigger than the accomplishment. In the sixth position: With spiritual initiates the tendency can be to attempt working on the whole world rather than the part of it applicable to your path. You must work on universality by working in your little comer. You can only improve the world by improving yourself and the extensions of yourself in your surroundings. In the seventh position: As the barrier between self and other comes down and the self becomes larger, filled with the other, it must still deal with the habits of the old ego which will try to see itself as not only larger, but in its separate state of mind larger and therefore better. This lays the basis for an ego power trip. In the eighth position: This may feel like someone has turned your world upside down. Some of your old world may survive this flood, but you should be prepared that some of it will not. What remains is as it should be and you must begin to rebuild on that. In some cases, this is primarily a matter of scaling back. 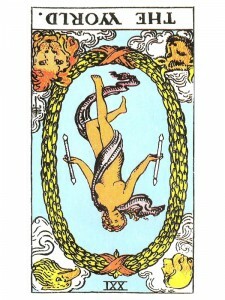 In the ninth position: Heart is not pleased with the world situation, it aches to see things otherwise and this, in spite of your achievements. In another extreme though, the heart does not agree with your mind’s view of the world. In the tenth position: You are part of the transformation of someone else’s environment and you will be a strategic part of their new world.